With over 28 years as an established retailer in the shoe business, Thomas’s Shoes in Evansville has the knowledge and selection necessary to get you into the right pair of shoes at the right price! Owners Tom and Janie Antes are dedicated to serving their customers the old-fashioned way, taking great care to actually measure the width and length of each client’s feet to fit the proper shoes to the customer’s needs. Thomas, the owner of the shoe store, began his business after working for Baynham’s Shoes for 16 years. He saw a need for a quality shoe store on Evansville’s growing west side, so he and his wife opened Thomas’s Shoes in the old Paul’s Menswear building. Thomas’s Shoes carries major brand names that offer size and width structure (narrow to extra wides), along with shoes that are made for extra depth, support, and stability. 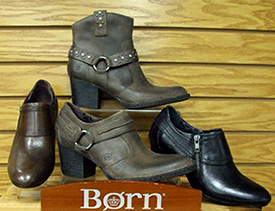 Our full line of shoes include Aravon, Born, Clarks, Cobb Hill, Dansko, Dunham, Earth, Florsheim, Grasshoppers, Keds, Merrell, New Balance, Olukai, Trotters, Timberland, Johnston & Murphy, Brooks and Vionic. carries full lines of dress, casual, and athletic shoes for men and women. At Thomas’s Shoes, it’s all about making sure you’re getting the right fit. Find out for yourself by visiting the shop.